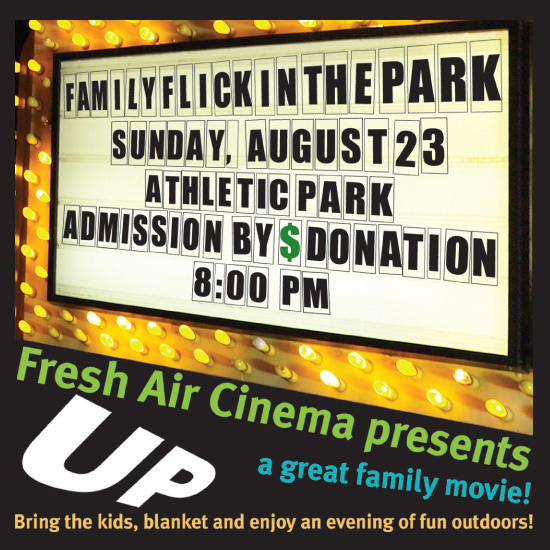 Fresh Air Cinemas are bringing the movie “UP” to Athletic Park in Medicine Hat (Sunday, August 23rd). It’s free admission, but you are expected to bring a non-perishable for the Medicine Hat and District Food Bank or a donation for the Santa Claus Fund. If you’re coming, arrive well before 9PM to see this Pixar – Disney movie on the three story inflatable screen. Don’t forget a blanket or some lawn chairs! Screen provided by http://www.freshaircinema.ca/. Sponsors include CCL Classic Communities, Rock 105.3, Servus Credit Union, and RBC Dominion Securities. Taylor has commented that there will also be a live performance by the band, Between Satellites before the movie starts and while everybody waits for the sky to darken. Tonight the Medicine Hat Mavericks are playing against the Weyburn Beavers at Athletic Park at 7:00 PM. There is a “Pack the Park” promotion going on tonight sponsored by the Medicine Hat News, which means they want to get as many people there as possible tonight. It’s a little short notice if you aren’t “in the known” or follow local Baseball. Athletic Park is located at 1 Birch Ave SE. If you want to snag some tickets, please stop by the Medicine Hat News (before 5:00 PM) and ask the front desk for the tickets. There should be enough left for everybody that stops by. Too late! This is our first ever “Sports Event” post. It’s a little short notice, but tonight is the home opener for the Medicine Hat Mavericks at Athletic Park which is located 1 Birch Ave SE (by the Police Stations, Curling Club and the Medicine Hat Arena). They are playing the Edmonton Prospects at 7:05 and the game is being sponsored by CHAT 94.5’s “Pack the Park” promotion. Thanks to Travis Sedore for the submission! Go down and have some fun!